Bright and alert, the Page of Swords is someone who never seems to run out of ideas. She is curious, always asking questions, and gifted with a sharp tongue and quick wit to match. Her aptitude for language also makes her an incredible communicator, and with her love of ideas, you may find her always engaged in some passionate debate. Her aptitude for language also makes her an incredible communicator, and with her love of ideas, you may find her always engaged in some passionate debate. She seems to thrive on almost a kind of nervous energy, as if there was too much inside her to say, the wheels in her head always turning. As a news bearer, she may bring news that is represented by her suit - particularly, gossip, legal matters, agreements. Alternatively, you may find yourself required to use her energy - be alert, keep your eyes open and stay sharp and vigilant. This card may indicate that you are very eager to execute an idea that you have been having or a project that you cooked up just recently. You are quite passionate about it, and you cannot wait to share the progress with others. Compared to your passionate heart, time seems to be standing still. It is time to be talkative. 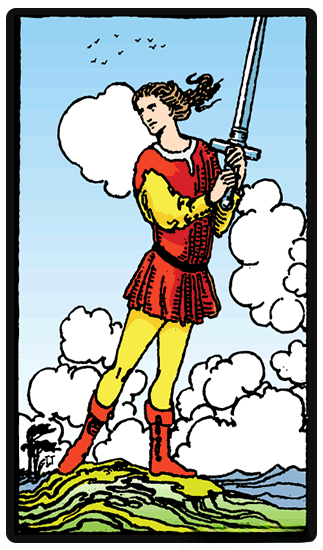 When a Page of Swords appears in a reading, it signifies communication and sharing of ideas. Whether it is someone else s ideas or yours, it is time to open up and talk about them as long as it is a constructive. When the Page of Swords is reversed, all the negative characteristics of her come out - and she may become almost dangerous. Being gifted with a sharp and alert mind, she may be using it for deception and manipulation. The sword that she wields may be used to create pain, her natural gift for language turned to a weapon. She may lack the understanding or the maturity to understand the suffering that she causes, feeling the rush that one gets upon lashing out. On the other hand, this page may be someone of empty words or promises - who though loves talking, does not really talk about much of substance. Take care to show strength and action behind your words, for you may be damaging your reputation.